Some new teenagers from PSP joined D3 this week! 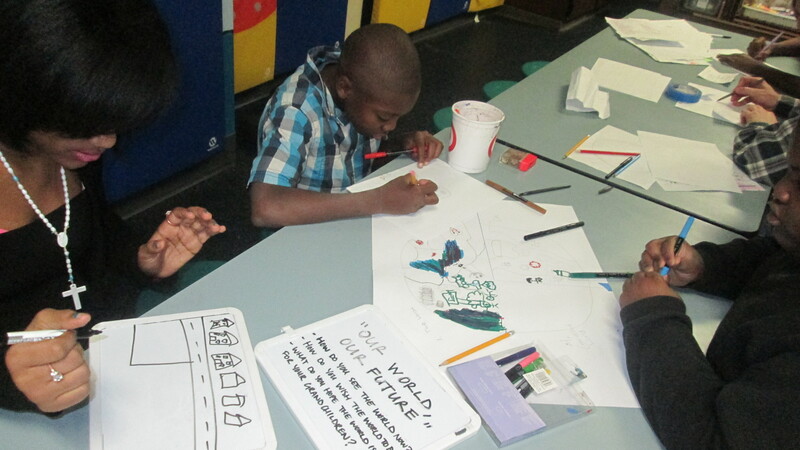 We introduced the Peace Poster project themed “Our World, Our Future,” and the progress the teens have made: going through the D3 process to complete the Lion’s Club contest poster, then revisiting the D3 process to step outside the contest constraints and refine the poster. Here the teens are learning how to revisit their own work, give constructive criticism, and improve upon what they’ve done. Teens work on their use of imagery and practice expressing their ideas without words. 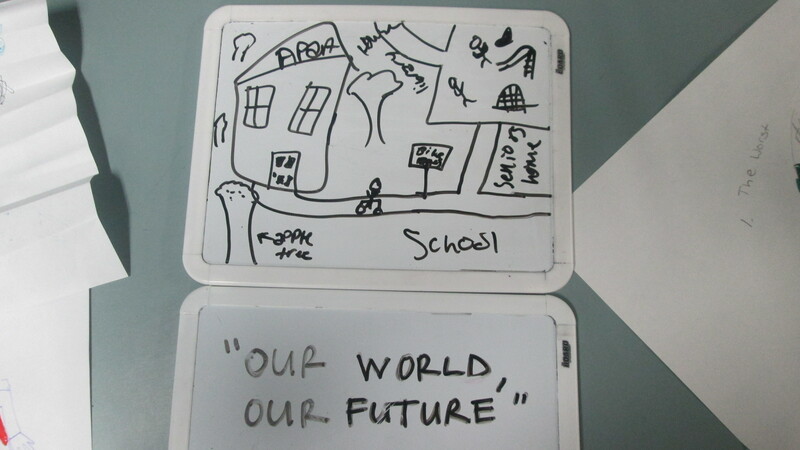 With two teens new to the process on Tuesday we focused on constructively critiquing the first Peace Poster and coming up with their ideas of what peace means and how they can visualize those feelings. We really enjoy the process of having everyone draw a series of things or feelings, then walking around after to view how each individual visually represents the same words. The teens have a strong understanding that it is people who make change happen, for better or worse, in our world. So, we watched a clip of the How It’s Made show on recycling pop cans. They talked about how it’s an amazing amount that gets recycled and how some of them find that show super interesting. 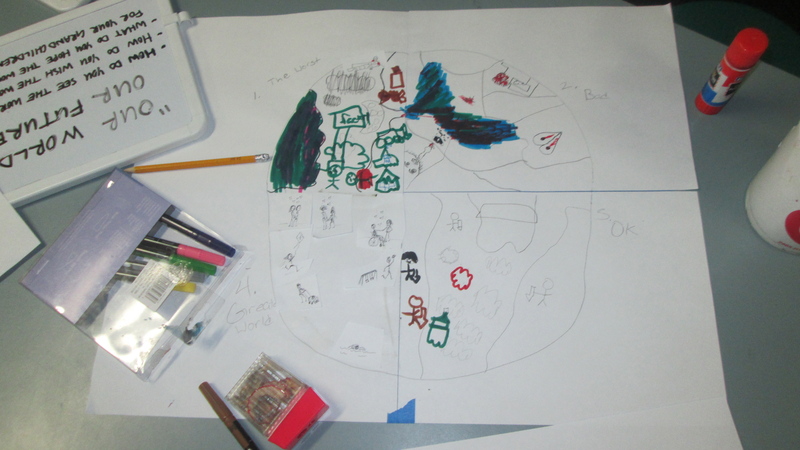 We moved into redefining the poster and the teens talked out some of the style and flow issues, deciding to draw one world divided in to four parts, each showing different stages of the world becoming a better place. They decided that the continents will remain unlabeled and ambiguous so as to depict our world as one rather than separated by countries. They are also thinking through what the background of the image will be – in the previous poster it was outer space, but maybe this time they will depict the atmosphere. Some teens talked about wanting to show sunshine in their image. Next week we will continue on in the Plan It Out phase and come Wednesday start getting it done! ← Peace From PSP Teen’s Point of View – D3 Style!